I am linking to Mamarazzi's Dandelion Wishes for Friday Confessional. I confess that I am a lost ball in high weeds when it comes to blogging. Still. There are a few things that I still just don't "get." I confess that I am very literal minded. So Sundae Sundays should be on Sunday, not Saturday, and Fussbudget Fridays should be on....here's and idea...wait for it... Friday instead of Thursday. I confess that I am blown away every single day by random acts of kindness in the blogosphere. 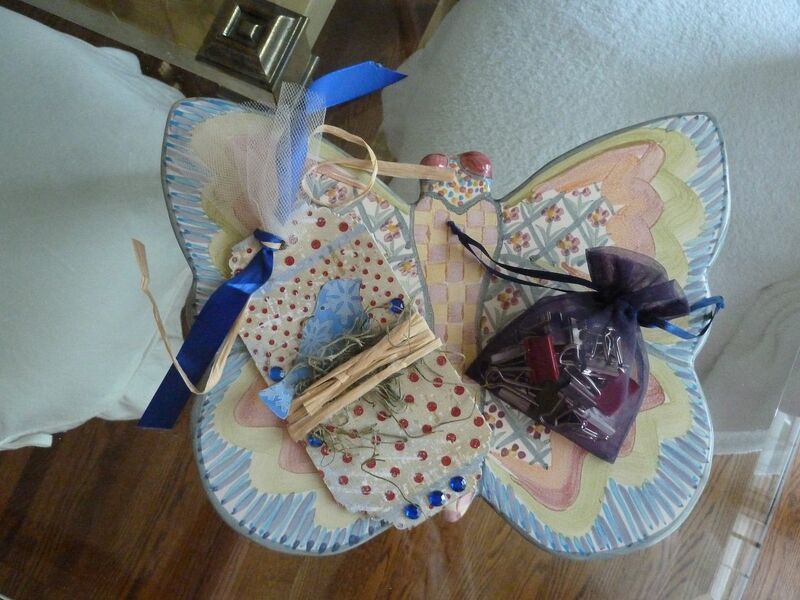 Just recently I was the recipient of a kind act from Tracie @ Fishtail Cottage. Tracie sent me these adorable clips because I commented on how much I liked her adorable frame craft you can read about here. 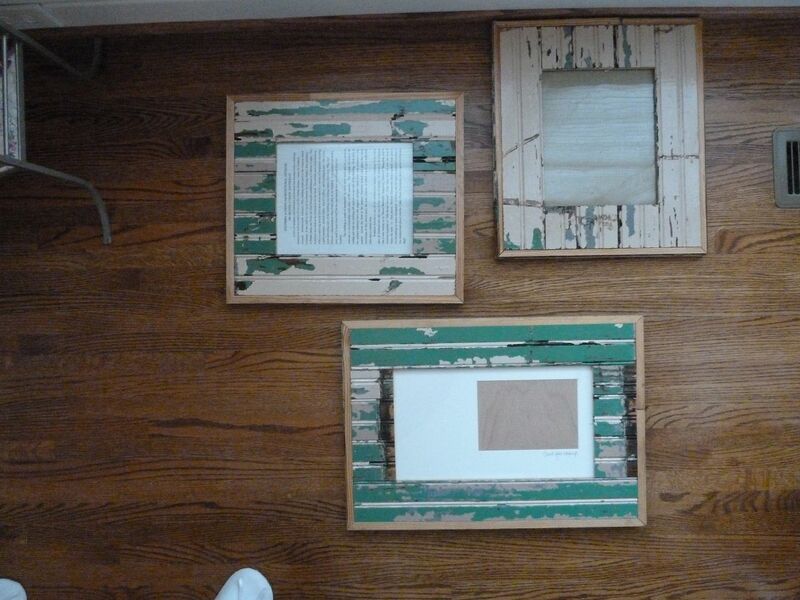 Tracie's cottage frames are absolutely *to die for*. You will enjoy this post if you missed it! Look what she sent me. Isn't she the best! I was so touched when I opened it that I confess I cried. Look at this adorable little tag. Love it! 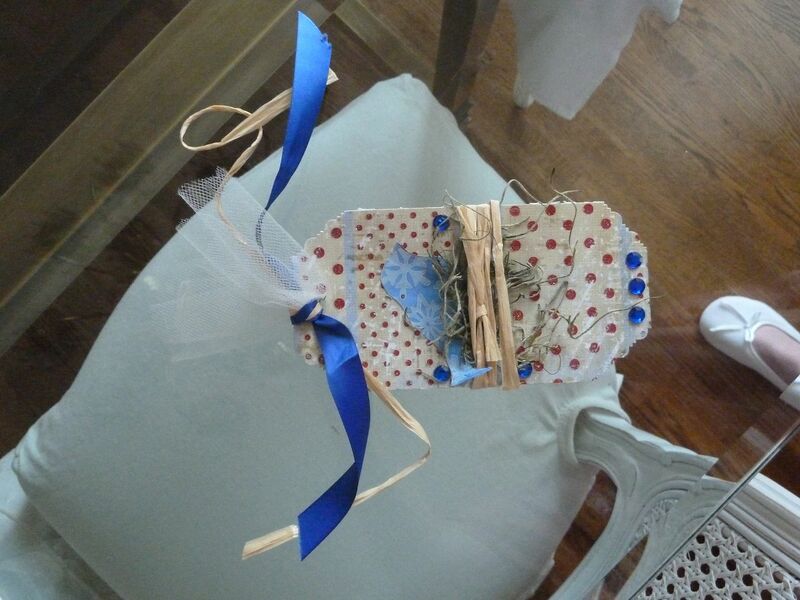 I am planning on making something very similar to what Tracie made for my daughter's dorm room. I confess that although I may not be the most creative blogger, by golly I am very resourceful, so I am borrowing Jane's cute idea. I will blog about it when I'm done. I confess that I am a spoiled brat. Mr. Art@Home spoils me rotten. He was in Cullman yesterday, and he went back to Southern Accents and bought me two more picture frames to match the one I bought last month (upper right) for all the spring prom, graduation, and horse show pictures I will want to display. Aren't they neat? The wood was taken from an old school in Tuscaloosa. And, finally, I confess that I have not been visiting fellow linky party-goers blogs like I should, either. So I have decided to only link-up to the parties when I know I will have the time to visit and comment. If I have participated in your parties a lot in the past and I seemed to have quit, please be patient with me! This is a very busy time of the year for us, and I will come back and participate when I fully can, by visiting other blogs and commenting. And, I confess, I hope I make it to the parties on time in the future. I also confess that I want to show-off my new frames @ Vintage Inspiration Friday. I am almost always late to Dandelion Wishes' Happy List weekend posting. I think most people do it on Saturday but I don't typically blog while at home so on weekends, I just don't make it. No worries! I'm in the same boat with the literal-mindedness. Maybe some people create their posts early and don't realize they can schedule stuff for that day? Or maybe it's a time zone thing? Either way, it's odd that a linky party would happen on a different day than it's supposed to. I don't get a lot of things about blogging too! :) I always feel as thou I do not know the "rules". I too, LOVE Tracie at Fishtail Cottage, she is a treat and just a lovely person. I LOVE those picture frames. Ugh, I'm giddy thinking of all the decorating that can go on simply BASED off them. All very good questions that we all have wondered about I am sure. This is a question kind of day. I love those frames and how sweet that your hubby thought of getting them for you. It is nice to have a spouse who still cares to make us happy after all these years. Unexpected gifts are the best. They mean so much more. Great frames... I confess, I love being spoiled! I also confess, I don't get why blog parties always start a day earlier... which makes me feel two days behind! How do these people know where you live to send you things?? that just scares me! Anywhozzles, I try to visit everyone on the list too and sometimes I confess I don't make it to the end...however, I will sometimes start at the end! I looooove HAPPY MAIL! It makes me so happy! I'm not sure which linky parties link up on the day before. I usually just link up with Mamarazzi for the confessionals and hers always go live at 12:00 midnight PST. You should link up with us next Wednesday! It will be fun! A Q&A for us to get to know everyone! i totally agree on a link party going live on the day it is suppose to. I agree with you, that is why I like mamarazzi so much, I have also seen other linkys where people have linked 1 post to at least 12 or more other linky parties, really people!! I think we have ALL felt that way. I love getting unexpected packages in the mail--they are the best! And just have fun blogging, you don't have to worry about getting it "right." How sweet of your bloggy friend! And I love those frames you got. What a thoughtful husband you have, too. I don't "get" lots of stuff, either. But, I think people read them on the day they are supposed to be posted? I really don't know! I usually schedule mine to post in the early AM hours before I'm even up, then I go link up when I wake up. Thanks for visiting me from Mamarazzi. I've followed her a long time. I think I'm gonna love your blog, too! I'm with you, there are just soooo many things about the bloggy world that I don't get either. LOVE your happy mail & those frames are so cool! I especially love the history behind them! Those frames are amazing! I sort of want some now. They totally don't go with the frame theme I've got going on, but I still want them! What an awesome hubby! Oh, and don't feel about not making the rounds. I have failed to do so the last few weeks. I try to comment on those that comment on mine, and then some, but it just ain't happen this these last few weeks. And I think the post at midnight of that day. I know that Mamarazzi like doesn't sleep, so she blogs and post around midnight. But I get what you are saying. Don't feel bad! With my link parties, I schedule them to run at the correct day, but I'm in Australia so they're on my time zone - another reason why I leave them open for several days! I'm always missing out on "single day" events and things that happen on U.S. and U.K. blogs, lol! Loved your honesty today ... it really made me smile. Blogging is hard to figure out and I'm right there with 'ya being "lost in the weeds" on some of the protocol in Blogland. I can't seem to sit down at the computer in the morning, but I enjoy blogging at night. I'm glad some of the parties open at night - it makes it easier to post and then enjoy the next day without feeling guilty that I haven't posted a blog yet. I didn't know about Mamarazzi's party. I'll check it out! Love the frames! I'm always late to just about everything! I've gotten better at it but I think I would still be linking up late no matter how many days early they started. I try to visit everyone who links up for Friday Confessional because it is one of my favs, however, if I don't have time to go through and read everyone who has linked up I make sure to at least visit the ones that commented on mine. Mr. is so sweet and good to you. I am so thrilled he spoils you and the girls! Love the frames! Ricki I have just enjoyed you're blog for the last hour or so when I suddenly stumbled upon it. I love it... thanks for sharing this.